A Barnhart China Painting Workshop taught by internationally known artist Alzora Zaremba, bottom center, was held at Coastal Bend College the week of October 8, 2012. 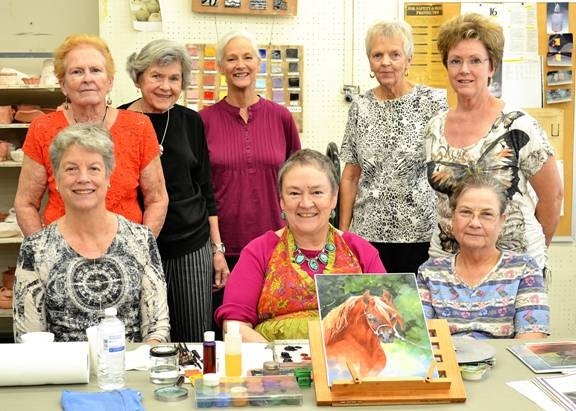 Zaremba has taught many workshops at CBC, and during this workshop attendees learned how to paint a horse head onto porcelain tile. Workshop attendees were from top left, Mary Ann Wheeler of Tilden; Shirley Kibler of Beeville; Sarah Gremmel of Beeville; Claudia Nelson of Beeville; Rosemary Stewart of Fulton; and bottom row, Alice Nelson of Lakeway; Alzora Zaremba of White Salmon, Washington; and Gayle Hollan of George West. For more information about upcoming Barnhart Workshops, please contact Jayne Duryea at (361) 354-2322 or duryeaj@coastalbend.edu.